It takes guts to wear Knize Two in public right after applying it. Sharp, waxy aldehydes and green flowery notes blast your sinuses with a scent reminiscent of a women’s floral perfume from the Seventies (e.g., Jontue, Charlie, Jean Nate). It strikes me as more feminine than masculine at first, but good nonetheless. Within about five minutes, however, Knize Two evolves into a beautiful, crisp and clean floral chypre that is elegant and masculine. It's extremely dry, and not overly sweet or powdery. Violet is the dominant note, buttressed by plenty of nice green, mossy smells. I can smell rose and geranium in the background that provide the scent with some subtle sweetness and extra complexity. The violet notes give the scent an overall silvery, dewy, and wet feel, but they're never harsh. The fragrance maintains a soapy, scrubbed-clean vibe throughout its duration, and is a perfect scent to wear when you’re dressed in your best clothes. Knize Two is ultra-smooth, and is seamlessly blended. Ignore the comments saying this is like Grey Flannel – it’s not. Yes, it’s a lot smoother, but Knize Two smells nothing like Grey Flannel. Although I somewhat prefer Grey Flannel, I have to concede that Knize Two is better composed. Grey Flannel brutalizes you with its bitterness and sharpness. 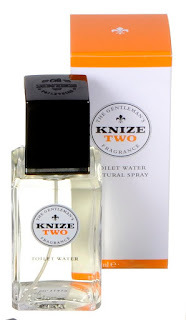 Knize Two is like stepping into a warm bubble bath with a martini. If you liked Givenchy’s discontinued but great Insense, you will probably love Knize Two. It’s a superb, classy fragrance, and one of the best masculine floral scents I’ve ever tried. What I love most about it is how it exudes cleanliness and good grooming for hours on end, without ever falling into today’s usual boring, synthetic “woody spicy” trap. One note of warning: DO NOT buy this without trying it first, unless you love florals. No matter how you cut it, Knize Two is seriously floral, making it truly a love/hate scent for sure. I absolutely love Knize two, I really don't even call it a floral- since what I get is a huge fresh/green burst with sublimated floral notes. This may be one of the most rare scents available as hardly anyone is talking about it. I've tried all the Knize line and this is by far my favorite.